The Office of Management and Budget gave agencies an extra two months to select a shared-services provider for security training and reporting under OMB’s Information Systems Security (ISS) Line of Business initiative. However, many agencies say they have already lined up shared-services providers for information security training and Federal Information Security Management Act reporting and are now writing migration plans and service-level agreements. The Housing and Urban Development Department will integrate the Environmental Protection Agency’s FISMA reporting tool into its current software, said Pat Howard, HUD’s chief information security officer. Other agencies have sought and received waivers to miss the OMB deadline. The Education Department received a waiver from OMB not to participate in the Security LOB until its current FISMA reporting system needs to be upgraded. Jerry Davis, Education’s CISO, said the waiver is valid for one year. Education will review its reporting needs again in 2008 before deciding whether to extend the waiver or switch to a shared-services provider. 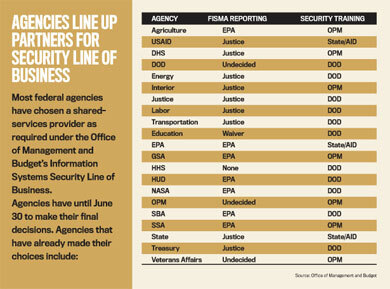 Based on commitments made, the Security LOB appears likely to have a larger effect governmentwide than OMB’s Financial Management or Human Resources Management Lines of Business, officials say. Many chief information officers and CISOs expect agencies to begin their migration to shared services early in fiscal 2008. OMB set a deadline of the fourth quarter of 2008 for agencies to complete their migration. OMB has taken a somewhat flexible stance toward agencies’ Security LOB plans, an OMB spokeswoman said. “If agencies are integrating the shared FISMA reporting and security awareness tools into their overall security program, then they are meeting the overall goal for ISS LOB,” she said. Mike Smith, Security LOB program leader, said he expected most agencies to develop a reasonable and aggressive schedule to begin using shared services. OMB will track agency progress by publishing agencies’ shared-services provider selections and migration schedules on Egov.gov. Education leaders said the big challenge for the department will be information security systems training. “While many of the solutions are geared toward the government employee, we have a lot of contractor training to provide as well,” Davis said.